Huawei delivered shipments of 54.2 million units to move into the second position with a record high market share of 15.8 per cent. 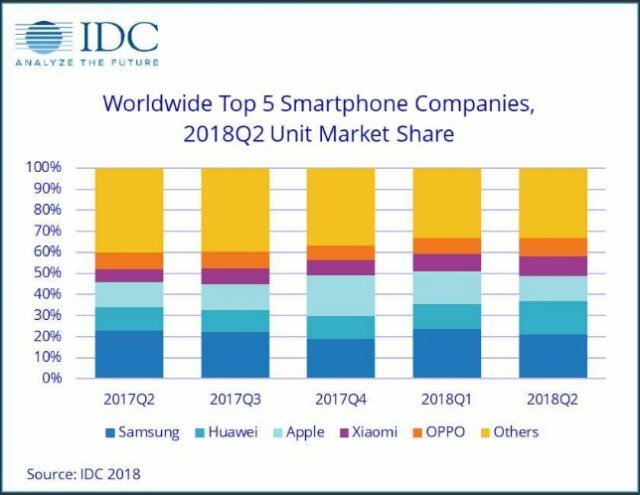 The arrival of Huawei in the second position marks the first time since the second quarter of 2010 where Apple wasn't the number one or two smartphone company in terms of market share, according to preliminary data from the International Data Corporation (IDC) Worldwide Quarterly Mobile Phone Tracker. Huawei delivered shipments of 54.2 million units to move into the second position with a record high market share of 15.8 per cent. Samsung maintained a comfortable lead, although indications from its earnings for the second quarter of 2018 suggest its mobile division revenues will be facing challenges moving forward. According to Mr. Ryan Reith, Program Vice President with IDC's Worldwide Mobile Device Trackers, the continued growth of Huawei is impressive, to say the least, as is its ability to move into markets where, until recently, the brand was largely unknown. It's worth noting that Apple moved into the top position in each of the last two holiday quarters after refreshing its product line, so it's likely we'll see continued movement among the top-ranked companies in 2018 and beyond. Mr. Reith added that for most markets in the ultra-high end ($700+) sector, the competition is largely a combination of Apple, Samsung, and Huawei, depending on the geography, and this is unlikely to change much in the short term. “At the same time, Xiaomi, OPPO, and Vivo are all slowly pushing their customer base upstream at a price tier slightly lower than the top three. This is an area they should all watch closely as the builds in this segment are getting increasingly more advanced,” he said. Huawei's P20/P20 Pro series found strong demand in the $600-$800 price segment, which helped Huawei build a high profile in the market. Huawei continued to earn a good reputation globally with the release of its "GPU Turbo" technology. Huawei’s midrange Android models, such as the Nova 2S and the Nova 3e, are proving to be wildly popular across Asia and Europe. The secret of Huawei's success comes from its consistent and massive investments in research and development (R&D). At Huawei, over 10 per cent of its revenue is invested into R&D every year. According to its 2017 annual report, there are about 80,000 staff members working in R&D or about 45 per cent of the total number of employees. According to the 2017 EU Industrial R&D Investment Scoreboard report from the European Commission, Huawei ranked number six among all the tech giants in 2017 in terms of R&D investment. Huawei has also built world-leading hubs of expertise such as the algorithm center in Moscow, the UX design center in San Francisco, the design center in London, the aesthetic center in Paris, and the 5G technology development center in Germany. The world's best talents have been recruited to strengthen the line of research and development. To introduce the best technology and ID, Huawei has built long-term partnerships with world-class partners to set unmatched benchmarks in the industry. To develop the best smartphone camera Huawei has been working with Leica on optical and image technologies since 2016. In the first six months, its flagship product, the P20 pro, which has the world’s first triple camera, earned the highest score in the mobile review of the world’s most authoritative image quality company DxOMark. Huawei also partnered with luxury brand Porsche Design for the Mate series' Porsche Design edition, in which it received a lot of feedback from the ultra-high-end market. According to IDC, smartphone vendors shipped a total of 342 million units during the second quarter of 2018, resulting in a 1.8 per cent decline when compared to the 348.2 million units shipped in the second quarter of 2017. The drop marks the third consecutive quarter of year-on-year declines for the global smartphone market and only the fourth quarter of decline ever. IDC believes this is the result of churn in some highly penetrated markets. However, many high growth markets still exist and should return smartphone shipments back to normal.